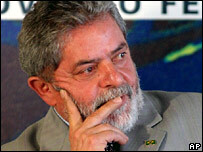 A close ally of the Brazilian president has been cleared of corruption charges by a parliamentary inquiry. Conservative lawmaker Sandro Mabel had been accused of distributing bribes from the governing Workers' Party (PT). But a full session of the lower house of congress found Mr Mabel not guilty by a wide margin. Correspondents say it will come as welcome news for President Luiz Inacio Lula da Silva, whose presidency has been rocked by the corruption scandal. Mr Mabel is the first official to be cleared in the investigation. Earlier this month, congress recommended that the former presidential chief of staff, Jose Dirceu, be expelled from parliament over corruption allegations. He is fighting a legal campaign to keep his seat. The scandal over campaign funding and alleged bribes for votes in congress has dominated public life in Brazil in recent months. The revelations led to the resignation of the party president and several high-level colleagues. Although Lula has not been directly implicated, the accusations have damaged his government's chances of re-election next year and held up a programme of economic reforms.